Jordan is one the most water-scarce countries in the world. Recognizing the need to increase water supplies to unlock Jordan’s potential for economic growth and poverty reduction, MCC invested $93 million to expand the As-Samra Wastewater Treatment Plant and mobilized an additional $110 million in private finance through a public-private partnership. Critical to the success of the project was the use of the build-operate-transfer financing model that enabled the Government of Jordan to invest more public funds in the water sector. As a result of the project, more high-quality treated wastewater can be used in irrigation, and Jordan gets more than one use out of each drop of water. Jordan is one the most water-scarce countries in the world, with limited water available for irrigated agriculture to spur economic growth and contribute to food security. In such a dry country, every drop of water counts. The expansion of the As-Samra Wastewater Treatment Plant, which treats wastewater from the Amman and Zarqa governorates, allows high-quality treated wastewater to be used in irrigation and frees up fresh water for use in higher-value, municipal purposes. Recognizing the need to increase water supplies to unlock Jordan’s potential for economic growth and poverty reduction, MCC invested $93 million in the treatment plant expansion, which helped mobilize an additional $110 million in private finance through a public-private partnership to make the expansion a reality. The treatment plant expansion and technological upgrade are expected to meet the regional needs of Amman and Zarqa through 2025, and improve long-term sludge management and disposal practices. In addition to producing cleaner water, the treatment plant will produce 12.8 megawatts of renewable energy, or 78 percent of the plant’s energy requirements, through biogas and hydropower. This represents an excellent example of the water-food-energy nexus. For these reasons, the project has won several international awards, including the Water and Energy Exchange International Award for Innovative Financing in February 2013 and the Best Water Project Award by World Finances Magazine in June 2013. Critical to the success of the project has been the use of the build-operate-transfer (BOT) financing model. Through this form of public-private partnership, the government delegates the responsibilities of financing, designing, building, operating, and maintaining designated facilities for a certain period to a private sector entity. The Government of Jordan benefits from having the private sector both raise the needed construction financing and guarantee the high-quality construction, operation and maintenance of the facility. At the end of the concession period in 2037, the facility will be transferred to the Government of Jordan at no additional cost. Through the As-Samra Wastewater Treatment Plant project, MCC enabled the Government of Jordan to invest more public funds in the water sector and allowed high-quality treated wastewater to be used in irrigation, giving Jordan more than one use out of each drop of water. Working with the private sector is a strategic priority for MCC for mobilizing co-investment. It is also a way to tap into the expertise, creativity, know-how, and efficiency business provides, which combined enhance the development impact and sustainability of MCC’s investments. To expand the treatment plant, the Government of Jordan’s Ministry of Water and Irrigation (MWI) signed a 25-year contract with the Samra Wastewater Treatment Plant Company Limited (SPC), a private company whose shareholders include Morganti, an American affiliate of the Consolidated Contractors Group; Infilco Degremont, an American company; and Suez Environnement, a French company. Together, these entities are referred to as the project sponsors. Additionally, a syndicate of nine local Jordanian and international financial institutions led by the Arab Bank provided a 20-year Jordan dinar-denominated, limited-recourse loan for the expansion. The As-Samra Wastewater Treatment Plant expansion represents an innovation for MCC as the agency’s first-ever participation in a major BOT project. In this case, the project sponsors have raised 50 percent of the expansion cost and are incentivized to maintain high-level operations and maintenance standards during the 25-year concession period. The operator, SPC, has received ISO 9001, ISO 14001 and OHSAS 18001 certifications, indicating the high-level of quality with which they conduct operations. One of the unique characteristics of this particular BOT financing is the mix of MCC grant funding of $93 million with $20 million from the Government of Jordan in the capital structure. MCC’s investment does not subsidize the private sector partners. The BOT agreement was designed in such a way that the project sponsors earn a return only on their portion of invested capital. By providing what is referred to as “viability gap funding,” MCC’s investment, alongside funds from the Government of Jordan, was crucial to attracting an additional $110 million from private debt and equity sources. Due to the grant nature of MCC’s investment, the Government of Jordan could justify its investment and this in turn made the project attractive for the project sponsors and the lenders. By bringing down the capital costs, the grant funding enabled the project, which has significant economic and environmental benefits for local rate payers and Jordan in general, to be financially viable. a highly efficient securitization of cash flows from the existing plant to support the equity component of the financing arranged by the private project sponsors. Structuring the financing package was challenging in a number of respects due to the profound political and social changes taking place in the region stemming from the Arab Spring that began in December 2010. As evidenced by its worsening fiscal deficit, Jordan also felt the adverse financial impact from a reduction in natural gas supplies from Egypt. Consequently, the Jordanian government was particularly sensitive to project costs and tariff issues. The expansion of the wastewater treatment plant at As-Samra will help improve environmental conditions in Jordan by increasing the capacity to treat growing volumes of wastewater from the Amman and Zarqa governorates. It will also increase the amount of treated water released into the Zarqa River, providing an additional source of irrigation water for many farmers while at the same time helping to restore the environmental integrity of the river, which has been severely degraded by industrial and other activities. Restoration of the Zarqa River is a top priority of the Jordanian Ministry of Environment and a key element of Jordan’s long-term water resource management strategy. As part of the expansion, the project sponsors and MWI agreed to work together to improve biosolids management and disposal practices and pursue economically and technically viable alternatives for biosolids re-use. Under the new agreement MCC fostered, the parties will jointly develop and update annually a detailed biosolids management plan that defines specific policies, procedures and standards for operation and closure of sewage sludge and biosolids facilities. They will also identify an environmentally and socially sound plan for permanent disposal and/or re-use of biosolids. The expansion project will continue to employ rigorous odor and air quality controls, including the capture of methane, a greenhouse gas, to produce electricity. The expansion complies with rigorous environmental standards, including the International Finance Corporation’s Performance Standards, MCC’s environmental guidelines and Jordanian law and regulations. It was also challenging from a structuring perspective. Because of its business model, MCC could not contract directly with the project sponsors or the lenders. MCC’s compact is with the Government of Jordan, and that agreement specifies conditions through which MCC funding for the As-Samra project will be made available to MCA-Jordan, the local entity accountable for administering MCC funds. Accordingly, neither MCC nor MCA-Jordan were party either to the project agreement between SPC and MWI or the financing documents between SPC and its lenders. However, the project agreement between SPC and MWI required that SPC meet all necessary conditions to access MCC’s grant funding and satisfy various payment conditions for each monthly drawdown. Cooperation among stakeholders and creative proposals from the project sponsors’ advisers were key to finding solutions to these issues, including risk mitigation strategies and contingency planning in case MCC funding is not made available to MCA-Jordan. MCC played an important role in ensuring that the project met the public policy and fiscal needs of the Jordanian government while balancing the interests of the private sector. 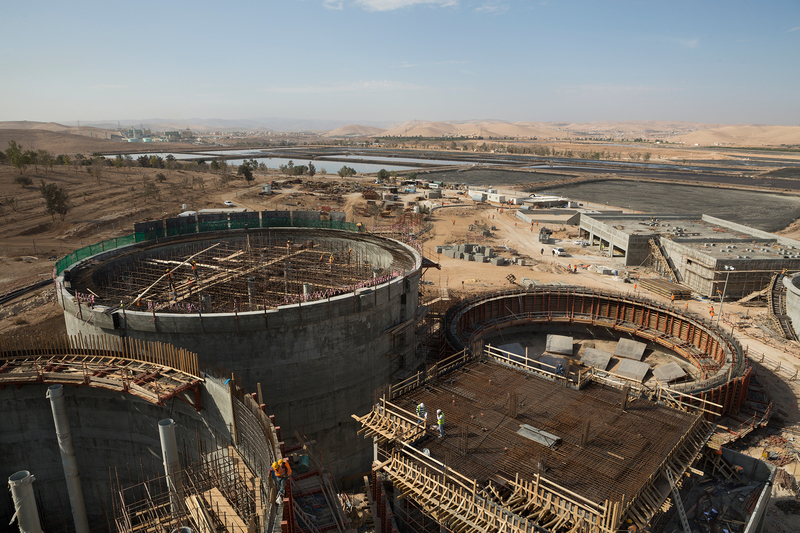 As-Samra, with its expansion, will be one of the largest and most modern wastewater treatment plants in the Middle East, treating more than 70 percent of all the waste produced in Jordan and serving the cities of Amman and Zarqa and its adjacent areas. Together with the Wastewater Network Project of the MCC compact, the As-Samra Wastewater Treatment Plant expansion will benefit more than 2 million individuals in the Amman and Zarqa governorates. These households will benefit from additional supplies of freshwater that can be transferred to these areas as these projects make larger volumes of treated wastewater available for substitution in agricultural applications in the Jordan Valley. This includes approximately 46,000 people, who are expected to benefit from consistent supplies of high-quality treated wastewater that can be used for irrigation. MCC hopes to adapt the contractual structure developed for the As-Samra expansion for use in upcoming infrastructure projects elsewhere in the world. This would allow projects that are economically and environmentally beneficial to be implemented and operated by the private sector where such projects would otherwise be unaffordable to the public sector. Every public-private partnership is different and many of the challenges at As-Samra were unique, but the solutions developed may be useful in many other contexts. Stephen Gaull is a member of MCC’s Finance, Investment and Trade Team and responsible for originating and implementing private sector development projects and public-private partnership investments. He has been involved in international finance and development since 1988 in Latin America, Asia and Africa. Prior to MCC, he worked at Aegis Capital Corporation, the Export-Import Bank of the U.S., Bechtel Enterprises, the World Bank, and the International Finance Corporation. Alex Russin is the resident country director for the Millennium Challenge Corporation in Jordan where he is responsible for overseeing the implementation of the $275 million Jordan Compact. He has over 20 years of infrastructure development and project-finance experience in Europe, Southeast Asia, Latin America, and the United States. Alan Cairns is the managing director and a founding shareholder of Mapstone Ltd. He has more than 20 years of experience in financing power and infrastructure projects and has worked extensively in Jordan and the Levant region. Thomas Langford is a financial consultant with CCC Investment Banking. Previously, as group vice president, he was responsible for company investments and represented CCC and its affiliate, The Morganti Group, in negotiations for the As-Samra expansion. He has more than 40 years of experience in the engineering and construction industry and has held senior executive positions with Parsons Corporation and Stone & Webster, Inc.